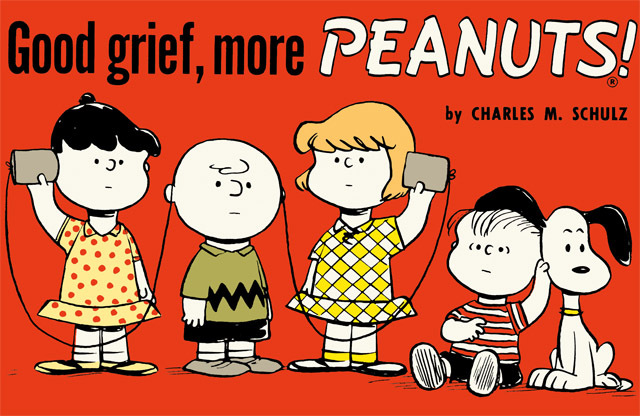 Titan Comics: GOOD GRIEF, MORE PEANUTS Review | Warped Factor - Words in the Key of Geek. Have you heard? There’s a new Peanuts movie coming. To celebrate, or rather to drum up and re-ignite interest in the characters, the delightful folk over at Titan Comics are re-releasing collected editions of the best of the original Peanuts strips. That’s terribly decent of them, because what you realise going back to the very beginning of the strips by Charles Schulz is actually how damn funny they were. That’s a thing that might just possibly have been lost over the years as the Peanuts gang grew into more and more of a ‘phenomenon,’ a marker of seasons, than the really funny, philosophical, beautifully observed comic-strips they originally were. There’s a sense in which the Peanuts TV movies which became how at least a couple of generations got to know Charlie Brown and the gang actively downplayed the comedy, by making what were undoubtedly good decisions – not having a laugh track and keeping the characters played by young actors and actresses, so they never ‘asked for a laugh’ in their performances. That has made it relatively easy to lose track of Schulz’ humour though, and by going back to these original strips, you can absolutely find it again. Peanuts #3, Good Grief, More Peanuts, collects strips from 1952-56, and it’s fascinating to see Schulz’ ideas in evolution, as well as his characters developing over time. Issue #2 saw the introduction of Lucy and Linus van Pelt to the Peanuts crew; Lucy already a classic fussbudget (Great 50s word, fussbudget – we should use it more), and Linus coming into our lives as a baby, just as Schroeder the piano prodigy did before him. By issue #3, Schroeder is growing into a somewhat strong-willed young man, with a sarcastic streak sharper than any of the rest of the gang. Issue #3 also introduces us to Pigpen – the kid who could ‘raise a cloud of dust just walking along a street,’ the kid (and there was always one) with a kind heart but on whom the grime was so ingrained all the nice kids were probably warned not to get too close. More than anything though, issue #3 shows the Rise of Linus, who starts off still as a baby, gets his famous comfort blanket and deploys it as the punchline to quite a number of storylines. While his character was still developing over this four year period, it looked very much as though Linus was going to become another source of ineffable frustration for our loveable loser Charlie Brown – here, Charlie Brown hands him a baseball and Linus makes like a miniature Harlem Globetrotter. He hands him a pack of cards to build a house with, and Linus builds several elegant pagodas by the time Charlie Brown gets three cards together. In a snowball war, Charlie Brown erects a basic line of frosty fortification, then looks up and sees Linus has built a medieval fortress, complete with turrets. “I hate smart-alecky kids” becomes a Charlie Brown catchphrase for a while in response to this treatment, and it’s probably ultimately in mutual fear of Linus’ sister Lucy that the two eventually bond. Here, as you might suspect from the issue’s sub-title, we also get the first – and many subsequent - uses of Charlie Brown’s more enduring catchphrase, “Oh, good grief!” though as yet we have still to see the first evolution of Lucy as his footballing nemesis. We also see Lucy’s infatuation with the cultured Schroeder in these years, and her leaning on his piano, asking him his thoughts on a whole range of topics, provoking what would come to be a customary response – a yell of “NO!” Clearly, Schulz was trying to develop as many catchphrases as possible in these years, because Lucy frequently re-iterates the line “I’m never going to get married” in this issue in response to Schroeder’s rebuffs. Snoopy continues his march toward glory over these four years too, developing more of the madcap antics for which he would later be known. If you ever doubted that Snoopy was a Time Lord, by the way, there’s a strip in here to put you right – everyone, one after another, trooping into Snoopy’s kennel, to check out his recreation room, which is apparently huge. But one of the weirdest things about this collection is Snoopy’s vocalisations and coherent thoughts – in later strips he tended to be more silent, or to have his thoughts written down by typewriter, but here, he has occasional thought-conversations with us, the readers, in the vein we would later come to expect of the likes of Garfield. And Snoopy too develops a catchphrase in this issue – “When, when, when, when will I ever learn?” – after some catastrophic conclusion to his antics. What becomes clear from this collection is that some of the original characters were beginning to wear thin in terms of their purpose in the strips. Where eventually there would be the little red haired girl for Charlie Brown to obsess over in his ever-unrequited quest for love and valentines, here it’s Violet, the girl who was if anything a proto-Lucy who fills that role, but beyond that, she’s beginning to fade into the background, her initial role of shouting at Charlie Brown more than ably usurped by Lucy ven Pelt. Likewise, where eventually there would be Peppermint Patty to be tomboyish and beat Charlie Brown at ‘boyish’ games, here, there’s simply Patty, who still destroys him at marbles, but beyond that she too is starting to fade into the background as Lucy utterly destroys Charlie Brown at Checkers. Shermy, Charlie Brown’s original equal and friend is still listed in the cast, but barely features in any strips here, his role being gradually filled by a combination of Schroeder and increasingly as the strips go on, by Linus. By 1956, the Peanuts gang was clearly changing, just as the gangs in which children actually congregated would gain and lose members due to real world circumstances. The rise and rise of Lucy and Linus was beginning to make some subsidiary characters less necessary than they had originally been, stronger influences in Charlie Brown’s life beginning to skew the storylines their way. These reprints from Titan Comic are a frank, innocent, joyful experience – allowing readers in 2015 to delve back sixty years or more and still get genuine, unqualified laughter from their wry, gently satirical commentary on life and its meaning. It’s a mark of Schulz’ genius and his evolving observational skills that really, given the evolution of society since then, there is little else from the time that can make the same kind of claim. Check out Peanuts #3, Good Grief, More Peanuts today.